The Beauceron temperament makes him a hard-working dog who loves a good challenge. This is a dog who’s at his happiest when he’s busy trying to figure something out. The Beauceron hails from France, and he started out as a working dog specializing in guarding flocks of sheep. 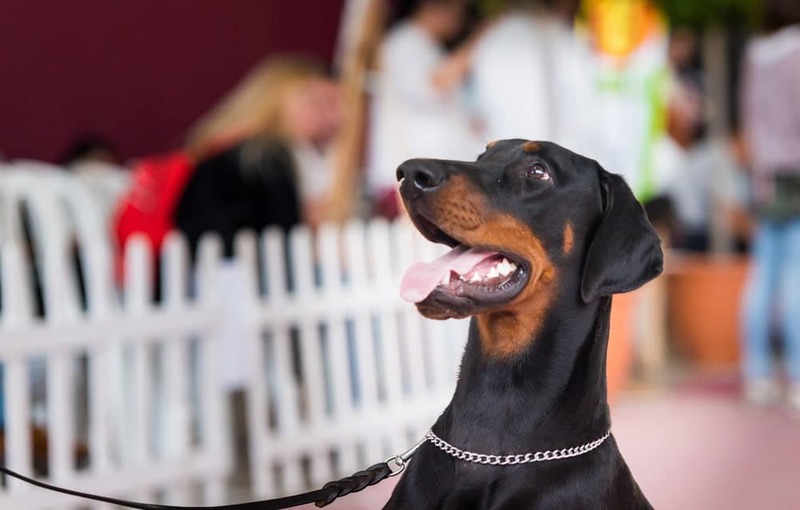 Interestingly, experts believe the Doberman Pinscher is a relative of the Beauceron. 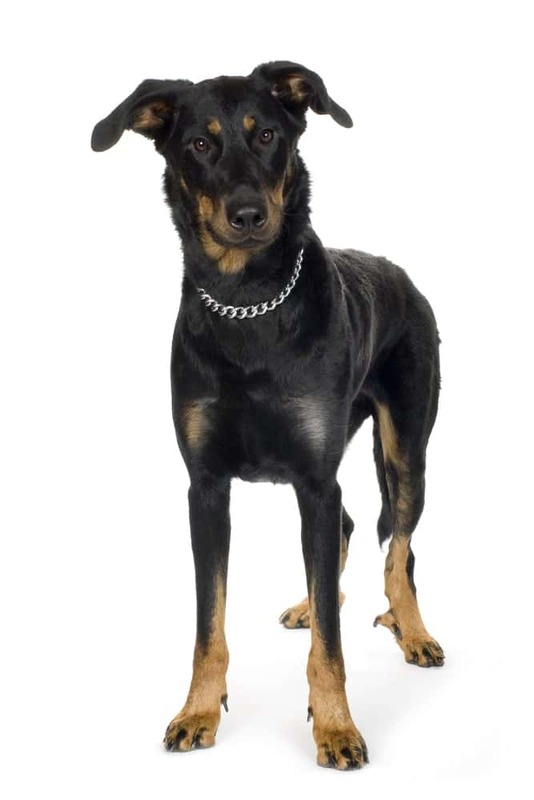 The Beauceron played a part in the creation of the Doberman breed. The military has used the Beauceron for such tasks as finding mines and wounded soldiers, as well as carrying messages and food. While the Beauceron is protective, he is not aggressive. He can be independent, but he’s also fairly easy to train, so long as you know what you’re doing. Approachable – Beaucerons are incredibly friendly if you socialize them early and often. Bold – This is a dog who is not afraid of much and will gladly venture into new territory for some excitement. Smart – The Beauceron’s intelligence comes in handy when you’re trying to train him. He can learn anything new you throw his way although he's a bit slower in his early years. Protective – The Beauceron doesn’t think twice about guarding his loved ones with his life. Composed – He’s usually a pretty chill dog who doesn’t lose his cool. Perhaps one of the most important tips about this breed is to keep him busy. Challenge him constantly. If you allow him to get bored, he will become destructive. Also, He’s not a dog that tires out easily. So if you’re an active person, he can keep up with you. The Beauceron has a strong inclination to chase animals that are smaller than him (prey). However, he can live in concert with cats, as long as you raise him with them from a young age. He may act aggressively toward dogs and other animals who are strangers to him. This is why early and frequent socialization is so important. Because he reacts suspiciously to adults he doesn’t know, he makes for a fantastic guard dog. The Beauceron also loves children. Training the Beauceron requires a bit more work than training other breeds does. For instance, if you’re unable to train him as required, then obedience training is a must. Harsh scolding, especially hitting or other forms of physical correction, are not ideal punishments. Instead, be firm and consistent. The Beauceron has both smart and loyal temperament traits, so he wants to please you and just needs help getting there. Some behaviors that you need to correct early on include jumping on people and furniture and grabbing people and things with their mouths. Beaucerons, in particular, have displayed these behaviors, which is why you need to recognize them early and nip them in the bud. One important thing to note is that while he is incredibly intelligent, the Beauceron takes a while to mentally develop. He’ll be slow on the uptake for the first three years of his life. You need to remember this and be patient while training him during this time. Once he’s three years old and his brain is fully developed, learning new things should come easily to him. If you are up to challenge of training your Beauceron and need a little help then check out these FREE Dog Training RESOURCES. While the Beauceron doesn’t require a lot of grooming, his double coat does shed, and often. Brush him weekly to catch the extra hair before it coats your house. Weekly brushings also promote the growth of new hair. Trim his nails regularly, and don’t forget the dewclaws. Those are the nails located higher up on his rear legs. 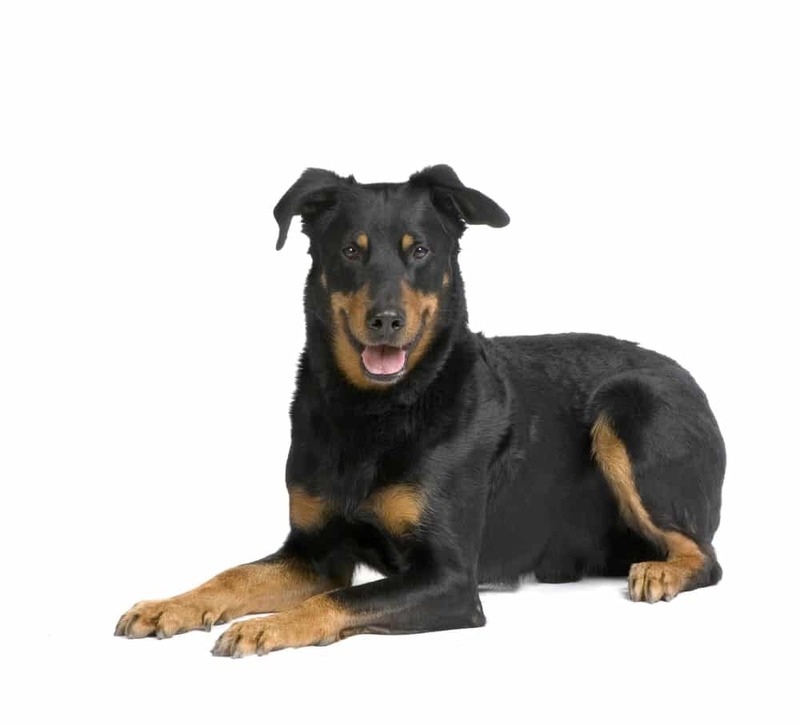 The Beauceron temperament makes for a dog that requires plenty of challenges, both physical and mental. If you’ve never owned a dog before, then the Beauceron is not recommended as your first dog. This is because he needs a wide variety of exercises and outdoor environments each day to be appropriately challenged. This is a dog who can do it all. He can pull carts, herd farm animals, whatever you need him to do. Variety is the spice of life, and that’s especially true for the Beauceron. As with any breed, there are certain health conditions that the Beauceron is prone to developing. Gastric Torsion – A bloating condition that can become life-threatening, if not treated early. Hip Dysplasia – There is probably no breed that is safe from this all-too-common problem. The average lifespan of a healthy Beauceron is between 10 and 12 years. So you've decided you'd like to add a Beauceron puppy to your family. You have a few options: you can adopt a Beauceron from a local shelter or rescue organization, or you can buy one from a breeder. If you choose to adopt, you may have better luck finding an older dog than a puppy. In either case, finding a Beauceron in the wild, so to speak, is a difficult feat indeed. The average Beauceron price is between $1,200 and $1,500. Compared to other dog breeds, he's pretty pricey. This is because finding a Beauceron for sale is actually rare – he’s not a common breed. The price can vary, depending on the quality of the dog's bloodline and the location of the breeder. If you would like to adopt a Beauceron dog, your first step is to check your local rescue organizations and adoption centers. However, Beauceron adoptions are more difficult than buying a Beauceron from a breeder due to their rarity. It may be a while before a Beauceron for adoption is available in your area. However, if you are set on buying one, regularly check the websites of available dogs at local rescue and adoption centers. You may also want to call your local shelters in case they have a dog available that, for some reason, is not on their website. Beauceron puppies are much easier to find if you go through a breeder. However, it can be difficult to find a reputable breeder, especially if you’re doing this for the first time. A good resource to consult is the American Beauceron Club. Here, you can find out everything you need to know about breeders specializing in the Beauceron breed. The site also explains in detail the things you should know before you buy. Also offered on the site is Beauceron merchandise, so you can announce to the world your love for the Beauceron breed. The Beauceron temperament makes him a dog that can and wants to work as hard as possible. You know how you feel at the end of the day after helping someone move out of their house? That’s how the Beauceron wants to feel every day. He loves to be busy, and he loves a challenge. Give him different tasks in different places, and he is one happy dog. Socialize him early, and he will be a regular social butterfly. He may not get along with cats if he isn’t raised with them, as he has a strong drive to chase prey. Remember that he takes longer to train than other breeds. For his first three years, his brain is still developing, so be patient and understanding when he takes a while to learn new concepts. This is a tough dog to find in an adoption or rescue center. If you’re dead-set on adding a Beauceron to your family, you will need to be persistent in finding one. If you choose to buy one from a breeder, make sure you do your homework first so as not to get ripped off. Next post: Are You Ready For The Affenpinscher Temperament?